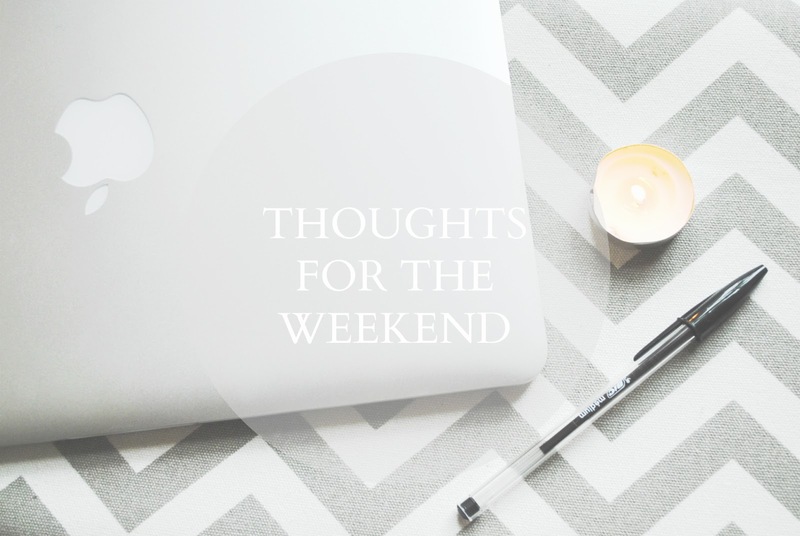 Welcome to Thoughts for the weekend, my new series in which every Friday I will upload a reflective post to round off the working week and give you something to reflect upon over the weekend. The topics will vary, but the intention will always be the same, and I hope that over the weekend you will come back and let me know some of your thoughts. For the first instalment, as you might have guessed from the title, I'm going to be writing about being your own company. It's something most, if not all of us will have to do at least once in our lives, and I think it's very important to be comfortable doing so; there will inevitably be times when you can't rely on others to provide you with company, and if you can be comfortable in those situations and actually enjoy that time by yourself, you'll find the prospect of being left alone much less daunting. It is also important, no matter how strong your relationships, to be able to be alone, as when it comes down to it you are the only one you can truly rely on. Now please don't think I'm some terribly cynical individual who doesn't trust relationships; in fact, I greatly value the relationships I have and treasure those people, but I also value my own company, and like to keep one foot on the ground by spending time alone every so often to make sure I don't become uncomfortable in my own company or too dependent on the company of others. This is not only a form of self-protection, but it is also a way to ensure that my relationships stay healthy; to me, a healthy relationship (be it romantic or otherwise) is one where both parties enjoy each other's company, but each also has their own space and is able to survive when the other is elsewhere, much like John Lennon's answer to the question Why can't you be alone without Yoko? - "But I can be alone without Yoko, but I just have no wish to be ... Both of us could survive apart but what for?". Now, it's not so hard to enjoy your own company when you have chosen to be alone, but when plans change or others are unavailable and you find yourself alone unexpectedly, it is important to still be able to enjoy those times. Don't get me wrong, when faced with this sort of situation I do initially feel a pang of loneliness, but I always try to nip that pang in the bud and prevent it becoming anything more by turning the situation around and seeing it as an opportunity for some 'me time'. Perhaps I'll go out and browse the market, or do some exercise, or watch a movie that no one else at home wants to watch, or simply browse Pinterest with a warm drink and a tasty snack. Whatever it is I do, I make sure that instead of sitting and longing for someone else's company, I make that time enjoyable for myself, and I think that's an incredibly important thing to be able to do. I wrote a post back in August about the importance of giving yourself some me-time, which you can read here, and although similar, the point of this post is slightly different - in this instance, I'm talking more about taking the times we are left alone and being able to turn that time into me-time, and being able to be your own company, not only for your sake, but for the sake of your relationships, too. What are your thoughts on being your own company? Is it something you struggle with, or is it something you can do with ease?